!!! ATTENTION: We are still working on our translation !!! In recent decades, with the help of ubiquitous mobility and internet, our planet has shrunk to a global village where virtually every human being can get in touch with each other. However, there are some political barriers / asymmetries for this unbelievably beautiful convergence, which the OWM wants to reduce. For the past 70 years, the trend in Europe has clearly been towards closer, more open coexistence. This convergence and the concomitant overcoming of national borders are not high enough to appreciate as a peacekeeping project. Building on this trend, the OWM is committed to the continual growth of such a political and social structure, such as the EU, which overcomes global boundaries and aims at a decent, open, humane, democratic, solidary cooperation based on human rights. In order to achieve global peace, the OWM advocates an economic adjustment process between the countries. Thus, the economy should grow slower in rich countries than in poorer countries. In general, the question arises in rich countries of how much or whether the economy still has to grow at all. In general, the OWM advocates economic competition between different regions of the world, but the foreign trade balance should not deviate too much from a balanced foreign trade balance for a long time, as this has long been the case for Germany. This contradicts the economic convergence process sought by the OWM. In such a situation, economically weaker regions should receive a large part of the surplus for reasons of solidarity. The very liberalized and globalized financial market should be regulated much more rigorously and globally. Any financial market product should be questioned for meaning and purpose. The financial market should serve only the real economy and not itself. In order to put a stop to this trend, OWM wants to introduce a global financial transaction tax. In general, the OWM is open to new economic models, which should be carefully tested in smaller regions. Rapid, deep-seated radical reforms, such as communist upheavals, are rejected by the OWM. 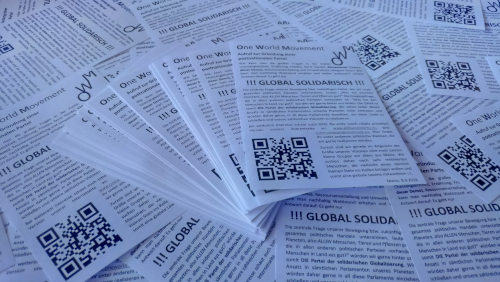 The OWM is committed to a truly solidary and in that way social economy. The basic requirement for this is a living competition. Thus, monopolization should be much more clearly stopped. The OWM is strongly committed to reducing asymmetric and exploitative trade restrictions. To strengthen very weak economic regions, however, temporary protection tariffs may be useful. Globally, minimum wages should be introduced and high minimum production standards should be met. Children should go to school for at least 10 years and are not allowed to work during this time. In order to promote fair trade, globally easy-to-understand quality labels with ambitious requirements should be introduced globally for all products. These requirements should be controlled by a neutral UN authority. The efficient detection of corruption and tax loopholes should be governed by strong international agreements. Compliance with these agreements should be neutral UN authority with strong competencies. The OWM is committed to a growing, solidary, social EU. At EU level, measures for economic convergence of countries should be strengthened. The OWM promotes a clear solidarity compensation for economically weaker regions of the EU, for example by using export surpluses of individual countries to a large extent for a solidarity compensation. At the same time, social standards should be further aligned, for example by standardizing unemployment insurance across the EU. In all these EU-internal demands, we see, as indicated above, the EU as a democratic nucleus that organizes a global, border-abolition, decent, pluralistic and heterogeneous coexistence. The EU should be open to all countries on this planet as soon as they meet democratic and decent conditions. In order to strengthen the EU with regard to national governments, the EU parliament should be elected in all EU countries on the same day and there should be transnational candidates for the political groups. In addition, the Commission should be downsized and designated by parliament. In this case, the national regulation "one commissioner per country " would be dropped. In addition, work should resume on an EU constitution, which will ultimately vote the entire EU population on the same day. In order to further interlink the nation states of the EU, the national armies of the EU should be transformed into a common army of the EU. In general, the EU should be more actively engaged in more peaceful conflict resolution. In the longer term, the OWM advocates the abolition of national borders, so that then the name of a person as "refugees" becomes superfluous. The OWM is currently campaigning for the consistent implementation of the Geneva Refugee Convention, which is why there is obviously no upper limit for refugees for the OWM. The OWM calls for a fair and uniform EU-wide asylum procedure, for the new arrivals the application for asylum in EU embassies, the abolition of the Dublin procedure, as well as the abolition of all harassment, such as the "Residenzpflicht", fast placement of flats (not collective accommodation and in no case anchorage centers), more German courses and a smooth access to the labor market. In addition, the OWM demands the abolition of toleration, so that the "refugees" immediately get a perspective. Children born for example in Germany and their parents should get the German / EU citizenship at birth. In the long term, the OWM advocates the abolition of national armies and thus any military alliances, but the United Nations alone should be able to intervene in the event of a crisis. As long as these goals are not achieved, military alliances should work much harder on peaceful solutions to conflicts. The OWM is campaigning for a ban on arms exports to states that do not respect human rights. In addition, the OWM is considering a general ban on arms exports and sole arms production by the UN. The use of armed drones should be banned, as it strongly promotes terrorism. Unless humanity manages to resolve major conflicts without belligerent conflict, weapons should be developed that are not life-threatening and simultaneously kill weapons should be banned internationally. In war crises, only the UN should intervene, and this much more efficiently and humanitarian than at present. There should be an international agreement that prohibits intervention by individual states. Every human being should have the starting conditions as similar as possible to society, in order to be able to make his / her life as free as possible. From birth to the completion of the vocational training, the policy should give starting conditions as equal as possible. Thus, the kindergarten, the school and the vocational training should be free of charge. Equal opportunities means first and foremost that the children's future is not fixed after the fourth or sixth grade by being assigned to one of several different types of schools. Rather, all children should experience the basic school time until the 10th grade together. Here, one should focus individually on the interests of the children. "Alternative" forms of education, which aim for a free, independent, self-questioning, tolerant and environmentally conscious thinking, should be supported. Ideologized / religious forms of school and thus also religious education which only focuses on a single religion, are rejected. Every person should be able to develop as freely as possible during school time and afterwards in working life. So the OWM does not want to fix wages in detail or limit them upwards. In solidarity, however, the OWM is committed to an adequate minimum wage and demands a much higher taxation of super-rich, while everyone should have the opportunity to earn unlimited money through ingenious ideas during his lifetime. The OWM is committed to a non-radical but significant redistribution of wealth to counteract the drifting apart of society. Within a company, the wage range (difference between the highest and the lowest wage) should be limited by the highest salary not exceeding the lowest salary by more than a certain factor (eg 8 or even to be discussed). In addition to the higher taxation of super-rich, the OWM calls for a significant increase in inheritance tax, especially to grant equal opportunities. In particular, luxury goods (yachts, cars, houses, apartments, expensive jewelry, etc.) should not be inheritable without significant deductions (>> 50%) to society. Everyone should work out material luxury themselves. The handling of private businesses still needs to be discussed; they should not be nationalized if possible in the long term. The OWM is very committed to a preferably non-violent interaction with each other. Central element is a peaceful, needs-oriented interpersonal communication, which should be practiced permanently in the kindergarten and the school. It should not focus on discipline but on personal development. The starting point here could be the non-violent communication (NVC) developed by Marshall B. Rosenberg. This should play a central role in the education of educators and teachers. In addition, the OWM demands a much more critical view of glorifying recreational pursuits, such as computer / console games, action films. Alternatively, every child should be given the opportunity to learn a musical instrument for free. In general, children should be offered a lot more peaceful hobbies, for example sports, music, reading. Ignorance and self-isolation often cause fears towards "others ", which in some humans results in rejection of "others". To overcome such fears, the OWM wants to encourage more individual exchange with initially "strangers". The OWM has the vision that every student in this world will be offered a large number of exchange programs in all countries free of charge. In addition, the OWM, for example, wants to make volunteering social years more attractive and popular to all places on our planet in order to expand the horizons of as many people as possible. This personal interaction will enrich individuals individually and, in the long term, be very important to the peace process in the world by reducing fears and building mutual understanding. Frustrated, frightened human beings, who are often referred to in Germany as "angered citizens", should make society more aware of all the positive achievements and developments that are to be criticized. In Germany, this is a whole series, for example: The many and deeply human aspects of the constitution (Grundgesetz), the peacefully expired reunification, the nuclear phase-out, which is currently supported by almost all parties, at least for the beginning ambitious goals in climate change and last but not least the relatively peaceful, very secure situation within Germany. So-called angered citizens should be much more aware of how well the average citizen in Germany is doing. With all this positive energy, in full recognition of this great happiness (Perhaps schools should also talk more about these positive developments / achievements that can lead to so much well-being / happiness.) the OWM also wishes to be fully aware of the big problems and inequities on this planet. Together with this positive Energy and a lot of optimism all the problems can be solved step by step. Here, we should also make it clear that our well-being in Germany / Europe is partly based on the misery in other countries. These injustices should be reduced and finally be eliminated. The OWM is strongly committed to equal rights for men, women, inter - and transgender people. The way adults live together is the freedom of each individual. No relationship form should be preferred by the state. The society / state should treat it on an equal footing. Specifically, the OWM is committed to equal pay for work of equal value and resolutely fights against all forms of discrimination such as religion, age, gender, etc. The challenges described in previous chapters ("Visions of Interpersonal Living Together") could theoretically all be solved within one day, they need only a change in our interpersonal relationships. The challenges now described unfortunately take time and are therefore a very special challenge. They are extremely important for a living planet earth, for today's and tomorrow's living beings. Man-made climate change is one of humanity's greatest challenges because it threatens our livelihoods. First, important steps to resolve the climate problem have just been made recently by the concessions of the largest greenhouse producers. They motivate OWM to fight global warming even more massively. To this end, the expansion of renewable energies should be accelerated even more. At the same time, combustion processes in all areas (mobility, power generation, industry, housing) need to be reduced even more vigorously. Many technologies are already mature today, some can be further optimized or even newly developed, this should be promoted even stronger and more efficient. Especially energy generation should be traded much more transnationally. The OWM rejects nuclear power plants decisively for safety and economic reasons. The issue of finite resources should be much more in the focus of public attention, not just in energy production but in all production pathways. All products should be designed so that their disposal is fully considered. For environmental and resource reasons, more than 7 billion people can no longer afford modern landfills or even completely uncontrolled disposal. Any consumption should be designed in 100% closed cycles. From production, through consumption to recycling, no garbage should be produced that harms the environment or can not be further processed. First concepts, such as Cradle-To-Cradle, are already existing. The OWM wants to spread these approaches even more and apply them as quickly as possible to all branches of production. In addition, pointless overproduction should be minimized. For example, over 30% of food production is simply disposed. The concept of food-sharing, which has been developed for a few years, counteracts this waste of resources. The OWM is committed to making these concepts much more widely available. Again, research should be widely and deeply funded. The pollution of our planet by waste should be stopped as soon as possible. Uncontrolled landfilled waste, for example in rivers, oceans, forests should be banned. In addition, the existing waste in nature should be collected by an international body and, if possible, recycled. Pollution or destruction in extensive agriculture should be stopped by very restrictive use of pesticides and fertilizers. Landmass sealing should be stopped, despite increasing populations, by making more efficient use of urban habitats. Natural habitats or sparsely populated habitats should be subject to much stricter conservation rules. Most of these areas should be protected for biodiversity and climate reasons. People living in these regions should be fairly compensated by an international body. The designation of these areas should, if possible, be globally coordinated by a panel of experts.